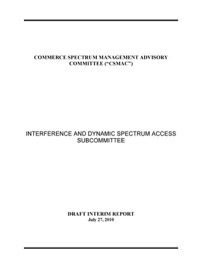 At the July 27 meeting of NTIA’s Commerce Spectrum Management Advisory Committee (CSMAC) the report of the Interference and Dynamic Spectrum Access Subcommittee was approved “subject to edits”. The final text is not yet available, but the version discussed briefly at the meeting is posted on NTIA’s site. For reasons discussed below this report is, or at least should be, a major embarrassment to NTIA as it is inconsistent with both the President’s spectrum policies and the charter of the committee. It both evades some major issues and pushes the parochial agendas of some committee members without trying to relate them to the broader public interests. “(N)ew technologies have the potential to free up spectrum from many of its existing uses. In combination with regulatory changes, new and emerging technologies can facilitate the repackaging, reallocation, and even sharing of spectrum. Reallocating spectrum to its most valuable use promises to be a win-win effort – creating value that not only spurs new innovations and creates new jobs, but also benefits existing spectrum users by allowing them to raise funds for transformative new investments. This CSMAC report repeatedly takes a negative view towards all innovation and an absolute priority on protecting incumbents. For example on p. 7 it says, “If an incumbent service makes changes to its system’s architecture or modulation technique that results in new interference, then the spectrum to be used to establish any guardband protections should be provided by the service making such changes.” So no matter how outdated an incumbent’s equipment is, no matter how inefficiently an incumbent uses spectrum, no matter how lightly loaded an incumbent’s band is, the burden of protecting the incumbent always falls entirely on the new comer in the mind of CSMAC - which just happens to be dominated by incumbents. Much of the report echoes the broadcast industry’s view on the database approach to TV whitespace, Docket 04-186. Perhaps not surprising since MSTV’s David Donovan, a lawyer, chaired this group. In private discussions, many CSMAC members observed that much of the long database discussion in the report was aimed at the FCC rulemaking and was irrelevant to the NTIA issues. Does this issue apply to NTIA processes also? Are NTIA harmful interference determinations any faster or more transparent than FCC ones? Will sharing of Government spectrum by technical innovators be that much more attractive than allocations in NG spectrum? CSMAC - the world wonders? •There is widespread consensus on the mechanisms and dangers of creating interference when licensing services that employ different duplexing technologies in adjacent spectrum. Note the use of the word “stakeholders” here rather than “incumbents”. Don’t the stakeholders in FCC proceedings include also the public who could benefit from new service and the advocates of new service? The use of “stakeholders” in the report draft clearly shows the consistent bias in favor of incumbents. In any case, the demonstration was that referred to is controversial and the issue has not been resolved by FCC almost 2 years later. Does the Interference Committee have any views at all on whether intersystem interference should be judged always on worst case/“minimum coupling loss” geometry or whether in some circumstances stochastic/probabilistic modeling should be used as it is from time to time in CEPT and ITU studies? Filters have a big impact on all types of interference other than cochannel interference. Does the committee have any thoughts on whether filters are getting better and how that might impact sharing and guardbands? Many types of wireless equipment now have a service life of a few years. Should this be taken into account in sharing and guardband determinations as the major cellular carriers have argued that PCS H block entrants can use increased power after existing handsets are replaced with newer models with better intermodulation immunity? Finally, since this is a report on both interference and DSA, shouldn’t it at least mention the observation of Preston Marshall, formerly of DARPA, that cognitive radios could be designed to select not just idle frequencies but idle frequencies that will not cause interference to receivers with limited interference rejection capabilities that are nearby in frequency and space ? John Muleta, former Chief of FCC/WTB, and I wrote a statement on this for the CSMAC that received little interest at the meeting in the rush to approve the flawed report. Readers might want to compare it with the report draft and draw their own conclusions. Please tell us what you think. We will post a link to the final version of the report when it is released.